1 Do you enjoy your town's annual fireworks display for the Fourth of July? The colors in a fireworks display depend on the wavelengths of light emitted by different chemicals as they burn. Light with the shortest wavelength appears violet in color. Light with the longest wavelength appears red. 2 More than one thousand years ago, Chinese people made black powder, the original gunpowder used in pyrotechnics. The word "pyrotechnics" comes from the Greek words for "fire art." Explosive and dazzling, a fireworks display is both a science and an art. The Chinese used the powder to set off firecrackers and small missiles. Black powder is still used today to launch fireworks into the air and to give fireworks an explosive charge. Even the ingredients, mainly saltpeter (potassium nitrate), charcoal, and sulfur, haven't changed since ancient times. 3 When the fuse in the fireworks is lit, the black powder ignites and produces gases that propel the firework into the air. Charcoal gives the firework a sparkling, flaming tail. 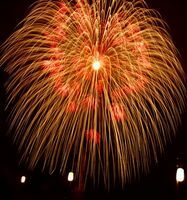 Energy is necessary to start the reaction in a fireworks display. If the fireworks are not packed correctly, the thermal reaction fails, resulting in what we call a "dud."